The recent revival in the monsoon will likely help increase sowing of kharif crops but a drought still looks a probability. The delayed arrival of the monsoon along with a sizeable rainfall deficit this year has disturbed the normal sowing cycle of kharif crops, especially oilseeds and pulses. This could impact output of crops, albeit not very significantly. And although the monsoon has slightly revived from the middle of July, weather experts say chances of drought remain high. The government is hopeful the situation would be under control. "A delay of five to 10 days does not impact crops in a significant manner. A gap of over one month can impact productivity," J.S. Sandhu, Agriculture Commissioner in the Ministry of Agriculture, told Business Today. The rainfall deficit has shrunk to 24 per cent as of July 24 from 43 per cent as of July 12. The India Meteorological Department (IMD), the official weather forecaster, has predicted higher rainfall in August compared to June and July. The monsoon arrived on June 6 this year, five days later than usual. The IMD projects rainfall during the June-September monsoon season to be 93 per cent of the 50-year average while private forecaster Skymet projects rainfall to be 91 per cent. The monsoon's late arrival and its slow progress have delayed sowing of paddy, pulses, oilseeds and coarse cereals. Madan Sabnavis, Chief Economist at CARE Ratings, said in a July 21 report that the deficit is a cause for concern because late arrival affects the sowing pattern as farmers tend to switch crops, thus distorting the equilibrium. Another reason to worry is the uneven rainfall distribution. While the sowing window is open till early-August and sowing coverage is likely to improve as the monsoon progresses, distribution will be key to determining crop output. Until July 16, while the deficit for the country was 36 per cent, the shortfall for northwest India was 49 per cent and for the central region 47 per cent. In Gujarat and Marathwada region, the deficiency is alarming at more than 60 per cent. Telangana, central Maharashtra and Punjab stare at a deficit of 50 per cent or more. The shortfall is 40 per cent or more in Vidarbha, Saurashtra, Kutch, Rajasthan, Haryana, west Uttar Pradesh and coastal Andhra Pradesh as of July 21, according to IMD data. According to private weather forecaster Skymet, the cumulative deficit at the end of July is likely to be around 20 per cent. Its analysis of the data between 1877 and 2013 shows that there were only five years-1877, 1918, 1972, 1987 and 2002-when June and July deficit stood at 25 per cent. The seasonal (June-September) deficit during these five years was 23 per cent, which amounts to a severe drought (deficit of 20 per cent and above). 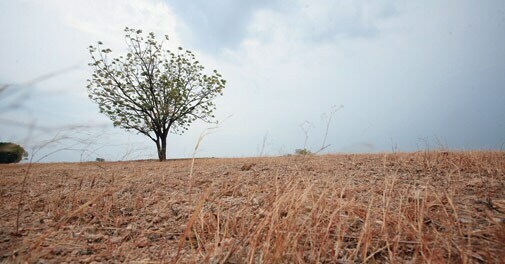 Skymet data also shows that there were 10 years between 1877 and 2013 when the June-July deficit was 20 per cent and the season's deficit was 18 per cent, qualifying as a moderate drought. All these 10 years were El Nino years. The probability of El Nino this year has been pegged at over 70 per cent by the IMD. The government, however, says it is prepared to handle any situation arising due to the deficiency in rainfall. Sanjeev Kumar Balyan, Minister of State for Agriculture and Food Processing Industries, told Parliament on July 11 that agricultural institutes have prepared contingency plans for 520 districts to implement location-specific interventions to sustain agriculture production in the eventuality of a weak monsoon. States have been asked to ensure availability of short-duration and drought-tolerant varieties of seeds to farmers. Besides, state governments can access the State Disaster Response Fund in the case of drought. They have also been asked to keep aside 10 per cent of funds available under the Rashtriya Krishi Vikas Yojana and other schemes to take steps for mitigating any situation arising out of drought. The government is also issuing advisories to farmers through Kisan Call Centres as well as public-sector broadcasters All India Radio and Doordarshan. Farmers have been advised to conserve water by using techniques such as mixed cropping and sowing of less water consuming crops such as ragi and millets. However, a drought may not have any significant impact on farm output. Punjab and Haryana, the grain bowl of India, have adequate alternate sources of irrigation and so the impact on agricultural output may be minimal. In 2012/13, for example, rainfall was 92.9 per cent of the 50-year average - a tad lower than this year's forecast of 93 per cent - but grain output slipped only 0.85 per cent to 257 million tonnes. The severe drought in 2009, when the rainfall deficit was 22 per cent, had led to a 16 million tonne drop in grain output in 2009/10. The impact was mainly on rice (10 million tonnes), and maize and oilseeds (3 million tonnes each), while pulses production was not affected and cotton output rose. Any drought may not also impact exports and imports of agricultural commodities. For instance, basmati rice exports rose from 1.5 million tonnes in 2008/09 to 2 million tonnes in 2009/10. However, maize export fell by 0.9 million tonnes to 2.6 million tonnes during the same period. Even if farm output drops, the government has plenty of stocks in its warehouses. The government has wheat stock of 40 million tonnes and rice stock of 21 million tonnes. That's substantially more than the buffer requirement and offers hope that the country would be able to withstand any adverse effects of any drought this year.